Nitrate / Nitrite test strips are for testing water in many applications from drinking water to water used to grow plants to fertilizer water runoff. Good test for a nutrient or water pollution science fair project. This test combines nicely with most other water tests. Water testing only takes a few minutes per sample. 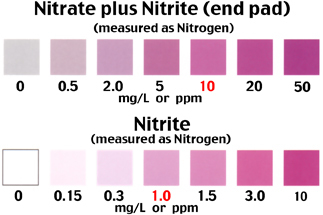 Nitrate / Nitrite test strips are for testing water in many applications from drinking water to water used to grow plants to fertilizer water runoff. Background information on this test Download # 135 Nitrate and Nitrite in Water is available as a PDF download.